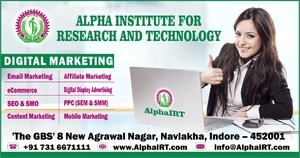 Alpha IRT is one of the leading digital marketing institute in Indore. They offer various courses where you can learn SEO, SMO, PPC, SEM, SMM, Affiliate, Email, Content, Mobile Marketing & Digital Display Advertising on different platforms at affordable fees. Other then this you can get Digital Marketing Counseling from our experts and learn about the wide career opportunities for freshers and experienced individuals.